Back last year, I asked the husband to buy me a proper cookery book. And by proper, I don't mean one of these glossy, celebrity-chef endorsed, tv-series inducing bestsellers, but a real proper cookery book like my mum used to have when I was a kid - one that explained the basics of cookery, teaches you how to cook simple food that tastes great and is all about the instruction rather than the presentation. I picked Leith's Simple Cookery and spent about a week reading through it but never got round to making anything. Despite a few poor reviews from some cynics on Amazon (well there were some on there when I ordered my copy), it seemed to be a great book for getting back to basics and learning the art of how to make classics well and recipes that can be adapted and won't fail if you've only got low fat creme fraiche rather than soured cream. So last night, I figured that I'd use it to find a good recipe for that French onion soup I've been meaning to make ever since Ocado delivered eleven million tonnes of onions that the child accidentally ordered via the Android app. And would you believe it? It's obviously not simple enough to make the book. the husband would lend me his X100! 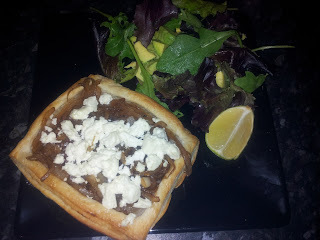 So instead, I plumped for the caramelised onion and goats cheese tartlets, thus using up yet more things (pastry, cheese, onions) from the fridge that is due to go to fridge heaven tomorrow. It's a great light lunch or tea and would make a fab starter too. Lovely combination of salty feta with meltingly sweet onions. Must admit I cheated a bit as I was supposed to caramelise the onions in the oven for 45 minutes but after a long day (up running at 5am, full day's work, mummy duties, three different dinners to cook) I caramelised them in a frying pan - and I was only doing a quarter of the quantity so it probably made more sense anyway. Roll the pastry out into a rectangle until it's about 5mm thick. Cut into four. Score a line around the edge of each piece about 1cm from the edge, taking care to not cut right through. Use a fork to prick the inner rectangle of each piece. Meanwhile, lightly fry the onions in a frying pan until they start to soften and caramelise - add a little water as necessary to stop them burning. When soft, add the vinegar and sugar and continue to cook over a low heat for 3-5 minutes. Remove the pastry from the oven. Top with the onions, crumble over the cheese then return to the oven for a further five minutes.